If the last post presented a fairly optimistic picture of the quality of Britain’s rivers over the past 30 years, this one is more of a reality check, highlighting some areas where our rivers are still suffering from pollution which means that they are unlikely to meet EU targets. The first pollutant I will consider in this post is phosphorus. The data for this and other inorganic nutrients is not summarised by regions but by the predominant type of agriculture in the catchment, reflecting the importance of run-off from land as a source of these pollutants. However, much phosphorus enters our rivers via sewage works and, as we saw for BOD and other pollutants associated with organic pollution, the trend over the past twenty years or so is generally downwards. Note that the start of the downward trend does not start until the mid 1990s. This is because reducing phosphorus in effluents only became a legal requirement when the EU’s Urban Wastewater Treatment Directive came into force. The horizontal lines, once again, represent the UK standards for dissolved phosphorus in rivers. There is a story behind these standards, in which I played a minor role. Trends in average inorganic phosphorus (PO4-P) concentrations in rivers draining three different land types in Great Britain. Note that the vertical axis is on a logarithmic scale. The horizontal lines show recent UK standards required to support different classes of ecological status (see text for more details). You’ll see that the trend lines for the two lowland land types are approaching but have not decisively crossed the line which indicates “good status”. Presence of a certain phosphorus concentration does not, itself, determine status but these indicate guide values that ecologists believe should be attained if the river is to support a healthy ecosystem. I was involved in setting the original standards and our team originally set values that were much lower than those that were eventually adopted. We had worked out concentrations that were associated with locations where we had found healthy ecosystems. However, when these figures made their way through the bureaucracies of our regulatory organisations, they encountered strong resistance from those charged with actually achieving the reductions. You’ll see that average concentrations have more than halved during the first decade of the 21st century – a considerable achievement. To be told that these concentrations were not low enough was a bitter pill to swallow. To cut a long story short, statistical black arts were performed behind the scenes (not by us, I hasten to add) to justify a higher standard, eventually set at 0.12 milligrams per Litre. The cavalier fashion in which this original phosphorus standard was set meant that, before long had passed, weaknesses started to become apparent. Not least of which was that rivers that should, on paper, have had conditions suited to good ecological status continued to have plant and algal communities that were not characteristic of good status. Eventually, the phosphorus standards were revisited and, in most cases, made more stringent, though not without opposition from the water companies who would bear much of the burden of meeting these. These new standards would pull each of the horizontal lines on my graph lower, and so make the overall position look yet more pessimistic. 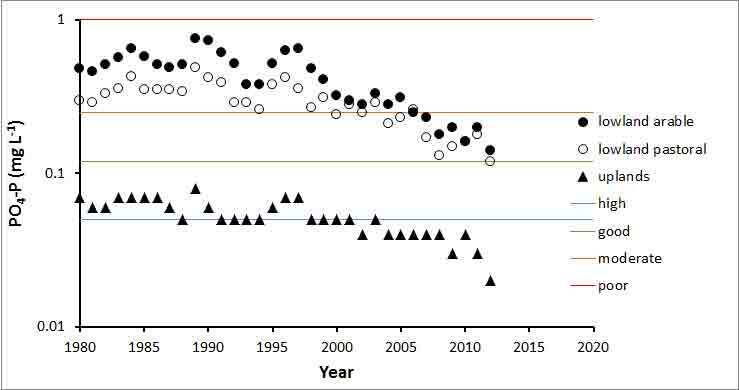 The trend for one other important plant nutrient in GB rivers is equally pessimistic. Concentrations of nitrogen as nitrate have shown virtually no reductions at all over the period that the HMS has been operating. There are, I think, two reasons for this. The first is that ecologists generally stress the importance of phosphorus over nitrogen as the key nutrient in freshwaters, which means that nitrogen concentrations have received less attention than, perhaps, they deserve. The second reason is more political: the biggest source of nitrates in our rivers is agriculture and DEFRA has to balance the interests of the environment with that of the vocal and politically-powerful farming lobby. That there is no ecologically-based standard for nitrates in UK rivers tells its own story. We could easily have produced a standard for nitrates at the same time as we revised the phosphorus standards (the information we needed was in the same spreadsheet) but were warned off. There is, in theory, a standard for nitrates in freshwaters, produced to meet the requirements of the EU’s Nitrates Directive but this was designed to protect human health, not ecology, and is set at a very high concentration. Rather than use this, I have plotted the standards used in the Republic of Ireland on my charts and, assuming that an equivalent UK standard would be of a similar magnitude, these show that the nitrate concentration of lowland rivers is generally much higher than these values. This is, of course, a very broad-brush picture but it gives us a rough idea of what is going on. 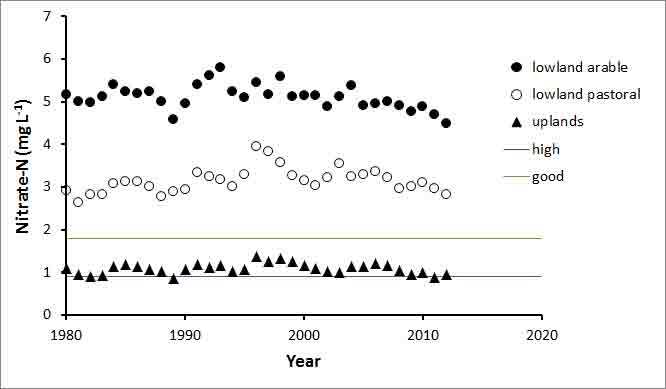 Trends in average inorganic nitrogen (as nitrate) concentrations in rivers draining three different land types in Great Britain. There are no current UK standards for nitrate-N concentrations required to support different classes of ecological status; those plotted here are for the Republic of Ireland. Looking back at the two posts, the picture that emerges is of reasonably good regulation of those types of pollutants that have been the traditional focus of regulation. Both the water companies and the regulators understand the processes need to reduce organic pollution levels in sewage effluents, and the necessity for doing this. The last twenty years or so have seen a change in focus towards inorganic nutrients and here we run into problems. First of all, the benefits for the public are often not immediately clear which, in turn, makes increasing water bills to pay for the expensive process of phosphorus removal more difficult. I have heard staff from water companies raise this argument several times when arguing against tighter regulation of phosphorus. But the second problem is that regulation of nutrients needs to embrace diffuse inputs from agriculture as well as point sources. This presents a huge problem as there are many more farms than sewage works to be visited, many of which are struggling to survive in a tough economic climate. Consequently, there is little political will to drive the process from the top. These are, indeed, challenging times for freshwater ecologists.